The USS Rentz (FFG-46) was named in honor of Commander George S. Rentz. BORN ON JULY 25, 1882 IN LEBANON PENNSYLVANIA GEORGE SNAVELY RENTZ GRADUATED FROM PRINCETON THEOLOGICAL SEMINARY, WAS ORDAINED BY THE PRESBYTERY OF NORTHUMBERLAND IN 1909, AND PASTORED CHURCHES IN PENNSYLVANIA AND NEW JERSEY FOR EIGHT YEARS. PASTORED CHURCHES IN PENNSYLVANIA AND NEW JERSEY FOR EIGHT YEARS. FOLLOWING ENTRY OF THE UNITED STATES IN WORLD WAR I, HE WAS APPOINTED ACTING CHAPLAIN WITH THE RANK OF LIEUTENANT JUNIOR GRADE AND ASSIGNED TO THE 11TH REGIMENT OF MARINES IN FRANCE UNTIL 1919. HE ATTAINED THE RANK OF COMMANDER IN 1924 AND HIS SEADUTY ASSIGNMENTS INCLUDED SERVICE ON USS FLORIDA (BB-30), USS WRIGHT (AV-1), USS WEST VIRGINIA (BB-48), AND USS AUGUSTA (CA-31). IN 1940, THE USS HOUSTON (CA-30 ) RELIEVED AUGUSTA AS FLAGSHIP OF THE ASIATIC FLEET, COMMANDER RENTZ TRANSFERRED TO THE NEW ARRIVAL. HE SERVED DEVOTEDLY AND ENTHUSIASTICALLY ON THIS CRUISER, PROVIDING THE SHIP'S CREW AND OFFICERS WITH GREAT HOPE AND PROMISE. ON FEBRUARY 4, 1942, HOUSTON CAME UNDER SEVERE ATTACK BY JAPANESE AIRCRAFT WHILE IN THE FLORES SEA.. COMMANDER RENTZ SPURNED COVER AND CIRCULATED AMONG THE CREW OF THE ANTI-AIRCRAFT BATTERY TO ENCOURAGE THEM. AN OFFICER NOTED THAT THE CREW MEMBERS AT THE GUNS “… SAW THIS MAN OF GOD WALKING FEARLESSLY AMONG THEM, THEY NO LONGER FELT ALONE..” DURING THE ATTACK, HOUSTON TOOK A DIRECT HIT THAT DISABLED TURRET III AND KILLED 48 MEN. LESS THAN A MONTH LATER, HOUSTON PARTICIPATED IN THE BATTLE OF JAVA SEA WITH THE AUSTRALIAN LIGHT CRUISER HMAS PERTH. BOTH SHIPS WERE OUTNUMBERED BY A JAPANESE TROOP CONVOY BUT THEY PERSISTED IN CLOSING WITH THE ENEMY, CAUSING SUCH CONFUSION AS TO HAVE A JAPANESE DESTROYER FIRE A SPREAD OF TORPEDOES THAT PASSED THE ALLIED CRUISERS AND CAUSED FOUR JAPANESE TROOPSHIPS CLOSE IN SHORE TO SINK. UNFORTUNATELY, THE WOUNDED PERTH AND HOUSTON WERE NO MATCH FOR THE JAPANESE CONVOY, THE JAPANESE ATTACK ON THESE TWO CRUISERS CAUSED THEM TO SINK BUT THEY WENT DOWN FIGHTING TO THE LAST SECOND. 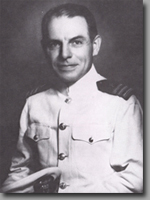 DURING THE ABANDONMENT OF HOUSTON, COMMANDER RENTZ ENTERED THE WATER AND ATTAINED PARTIAL SAFETY ALONG WITH OTHER CREW MEMBERS ON A SPARE MAIN FLOAT FROM THE HOUSTON'S LOST PLANES. AWARE OF THE EXTREME OVERCROWDING AND DANGEROUS OVERLOADING, HE ATTEMPTED TO RELINQUISH HIS SPACE AND HIS LIFEJACKET TO WOUNDED SURVIVORS NEARBY, DECLARING “ YOU MEN ARE YOUNG, I HAVE LIVED THE MAJOR PART OF MY LIFE AND I AM WILLING TO GO,“ NO ONE WOULD OBLIGE THE GENEROUS, FEARLESS CHAPLIN. AFTER SEVERAL ATTEMPTS OF LEAVING AND BEING BROUGHT BACK BY HIS SHIPMATES, HE UPLIFTED THEM WITH PRAYERS AND SONGS UNTIL, ULTIMATELY, HE SUCCEEDED IN PLACING HIS LIFEJACKET NEAR A WOUNDED SAILOR WHO DID NOT HAVE ONE, AND COMMANDER RENTZ COURAGEOUSLY SLIPPED AWAY INTO THE SEA ON THE MORNING OF MARCH 1, 1942. A photo taken on March 28, 1938 on the fantail of the USS West Virginia. 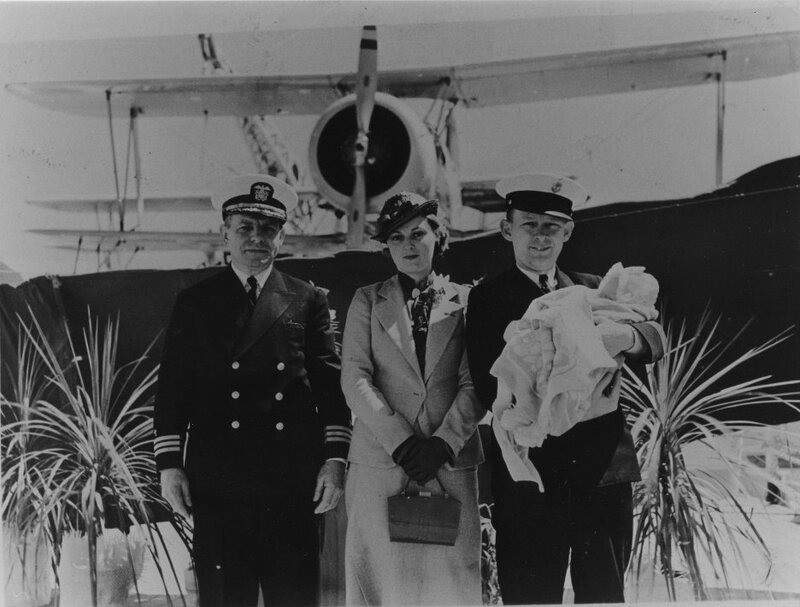 From right to left are James Warner holding his son Stanley, Mrs. Warner and Chaplain George S. Rentz.